We have a large selection of yard sign sizes to choose from! All yard signs are digitally printed in full color on our high quality 4 mm Corrugated Plastic (coroplast hollow "fluted") material. 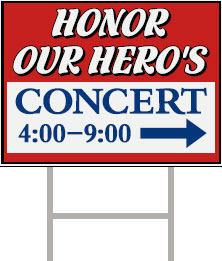 Standard size is 18” high by 24” wide printed on both sides with wire stake, cost is only $19.50! A minumum of seven signs must be ordered. These signs come complete with wire stake for easy installation into ground. Can be lettered on one side or both sides. Send us your image file or let us design for you.